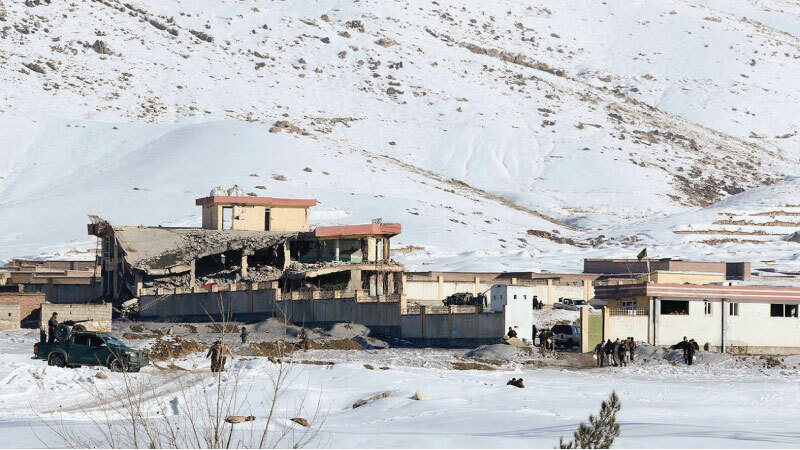 A general view of the collapsed building of Afghanistan's intelligence office in Wardak, Afghanistan on Monday. AFGHANISTAN: The Taleban infiltrated an Afghan intelligence base on Monday (Jan 21) killing dozens who worked for the agency in what officials said was one of the deadliest attacks against the intelligence service in the 17-year war with the Taleban. While the Afghan police and army have been dying in record numbers, the loss of elite intelligence forces - who are better trained and equipped - was another indication of the violence stretching the Afghan government's defences, even as the United States may be preparing to withdraw some of its troops. The attack, early Monday morning, came hours before the Taleban announced it had resumed peace talks with US officials. It was a sign, analysts said, of how violence is likely to grow deadlier even as the sides of the long war have indicated a willingness to seek a negotiated settlement. Akhtar Mohammad Khan Tahiri, the head of the provincial council in Wardak province, where the base is located, said the target was a training centre for pro-government militia members run by the National Directorate of Security (NDS), Afghanistan's intelligence agency. The Taleban immediately claimed responsibility for the attack. The group's spokesman, Zabihullah Mujahid, said its fighters had detonated an armoured Humvee full of explosives that "destroyed large parts of the base", on the outskirts of the city of Maidan Shahar, before other suicide bombers arrived to raid the facility. Several senior Afghan officials put the number of dead between 40 and 48, while as many as 60 more were wounded. But Mohammad Sardar Bakhtyari, the deputy chief of Wardak's provincial council, said the number of dead was higher, with the attack killing 50 intelligence personnel from a newly arrived unit out of the unit's 150 members. "First, the Humvee full of explosives drove inside the base with high speed," Mr Bakhtyari said. "Those intelligence officers who were at the first gate were wounded in the explosion, but the Humvee was detonated inside the base." "Then three other suicide attackers came with a white Toyota to kill those who were wounded," he continued, "but those wounded NDS members opened fire on them and killed all of them. There was no long shootout." "The explosion was very big," said Mr Sharifullah Hotak, a member of Wardak's provincial council. "It destroyed the building and damaged some houses close to the training centre." It was unclear how many of the dead were officers of the Afghan intelligence agency versus local militia members they were training. While security officials said the casualties were a mix of both, a statement by the Afghan president's office made no mention of the militia members and said intelligence agency "personnel" had been targeted. Casualties of Afghan intelligence officers have generally been lower than those of other forces, in part because of the better training and equipment they have. But in recent years, as regular forces have been stretched by intensifying fighting across the country, Afghan intelligence officers, particularly the agency's special forces, have often found themselves operating like regular forces, deployed to different areas to hold the line and taking on other tasks they are not meant for. Over the summer, at least 11 intelligence officers were killed in an explosion in the southern city of Kandahar. The intelligence agency, long mentored by CIA advisers, has also worked to extend its forces around the country by training local militias. In the past, security officials have played down those efforts, casting the militias as organic movements of locals who are staging "uprisings" against the Taleban. But on Monday, they acknowledged that many men killed in the attack were militia members they had been training. The intelligence agency was using the centre to train and equip pro-government militia members before sending them to other parts of the province to support security forces, said Mr Hotak, the Wardak provincial council member. Despite the cold winter in most parts of the country and US efforts to persuade the Taleban to sit down for talks with the Afghan government, violence continues unabated across the country. Zalmay Khalilzad, the US special envoy for facilitating Afghan peace talks, is on the latest of several trips to the region over the past couple of months to build momentum for talks. After visiting Pakistan, where Taleban leaders enjoy sanctuary, Khalilzad struck an optimistic tone. "We're heading in the right direction with more steps by Pakistan coming that will lead to concrete results," he wrote on his Facebook page on Monday. Hours after the attack in Wardak, the Taleban put out a statement saying they had resumed talks, which had seemed stalled for weeks, with US diplomats in Doha, the capital of Qatar. "Following American acceptance of the agenda of ending invasion of Afghanistan and preventing Afghanistan from being used against other countries in the future, talks with American representatives took place today in Doha," the Taleban spokesman said in a statement. Dr Omar Sadr, a researcher at the Afghan Institute for Strategic Studies, said experience from other peace efforts showed that violence often goes up before talks reach an important stage, as all sides try to gain more leverage at the negotiating table. Dr Sadr said that while large Taleban attacks in the past would draw emotional responses from Afghan leaders who would pull out of talks, the year ahead will likely be shaped by violence and talks going hand in hand. The talks have been focused between the Taleban and the Americans, and the Afghan government has expressed frustration at feeling marginalised. The Taleban have said they want agreements with the Americans over the future of US troops in the country and the release of Taleban prisoners before they discuss an end state with the Afghans. In December, the Trump administration ordered the military to begin plans to withdraw about 7,000 US troops from Afghanistan in coming months, a move that seemed uncoordinated with the US negotiators and whose timing surprised Western diplomats in Afghanistan. But the drawdown has not yet begun, and Defence Department officials have been unable to clarify how many troops will leave the country or by when.